This week on Kickstarter a new accessory has launched called the Smart Cargo, which has been designed to be used with Apple’s iPad tablet and has been created to help you carry those extra iPad accessories that normally end up getting lost in your pockets. 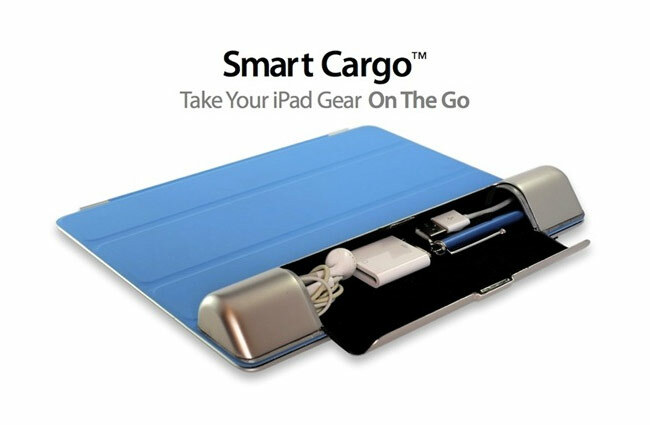 The Smart Cargo is constructed from plastic and has been designed to securely attach to your iPad’s Smart Cover using the magnetic power of 14 magnets. Watch the video after the jump to get a better idea on how the innovative Smart Cargo could help you carry your extra iPad accessories with ease. The Smart Cargo has been designed to fit perfectly within the triangular space that is created when you roll up your iPad Smart Cover and provides enough space to carry headphones, stylus and adapters. As well as offering a wrist support and handy iPad grip. The Smart Cargo project is currently over on the Kickstarter website looking to raise enough pledges to make the jump from concept to production. So if you think Smart Cargo is something you could benefit from, visit the Kickstarter website now to make a pledge and help Smart Cargo become a reality.